How Is a Centrifuge Used? Centrifuges are used to increase the sedimentation rate of particles by using centrifugal forces, which are forces that are greater than gravity. Centrifuges consist of several parts including a rotor, motor, imbalance detector, tachometer, safety lid, and braking system. Some centrifuges also include a refrigeration system. They are classified into three categories: low-speed, high-speed, and ultra-speed. Low-speed centrifuges are used to separate serum or plasma from red blood cells, and to harvest and purify various precipitates and cell fragments. 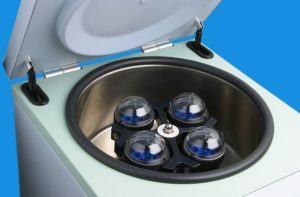 High-speed centrifuges are used to separate cell constituents. They are also used to isolate and purify viruses. Ultracentrifuges are mainly used to isolate and purify membrane components. How Can a Centrifuge Be Damaged? Improper centrifuge care can lead to damage of critical centrifuge parts, resulting in the malfunction of the centrifuge. Aggressive chemicals can lead to corrosive spots on the rotors and rotor-buckets, which can in turn lead to holes forming in the rotor. Improper cleaning can also damage coatings and lead to corrosion. Sensors, gaskets, seals, and wiring can become damaged if flood with water. What Should I Do to Keep My Centrifuge Working Properly? There are several important cleaning and safety procedures that should be used to ensure a centrifuge works properly. First, you should clean your centrifuge daily. This includes cleaning both the exterior and the interior of the centrifuge. 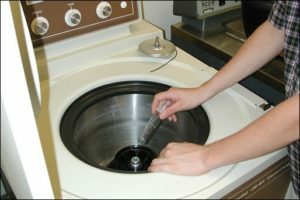 A sponge, warm water, and a mild detergent can be used to clean the centrifuge. Do not use caustic detergents or a product that contains chlorine ions. A plastic scrub brush should be used to avoid damaging the coatings. When you are finished cleaning the centrifuge you should use a centrifuge lubricant to lubricate the bucket grooves and rubber seals. You should also use approved disinfectants and/or “spill” kits to disinfect the centrifuge on a regular basis. 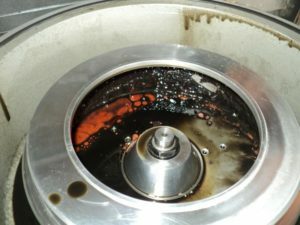 In addition to cleaning the centrifuge, you should also check for residue and corrosion on the rotors on a weekly or monthly basis. Why Should I Schedule Regular Preventive Maintenance For My Centrifuge? Scheduling regular preventive maintenance with a trained technician for your centrifuge is vital because it increases the durability and functionality of the centrifuge. Regular preventive maintenance also ensures accurate results and reliable performance, which will benefit your research. Regular preventive maintenance includes the inspection of the physical condition, inspection of the electrical condition, cleaning, and testing of the centrifuge. Regular preventive maintenance will not only prevent damage, but can also identify damage that has already occurred and repair it before the centrifuge is no longer usable. In order for your centrifuge to be in the best possible condition and to ensure the reliability of your research you should regularly schedule preventive maintenance with a trained technician.